Please, Stop the iPod DJ Mixers / iTunes DJing. Now. And it’s not much fun to listen to, either. For instance, two DJs were playing a party I was at last night for Res Magazine, both with a PowerBook. One was using a serious DJ program, and he did crazy mash-ups of distorted audio and mixed grooves with The Notwist and threw in Dylan at an unspecting moment. That’s fun. The second used iTunes playlists of preexisting mixes. That was boring. The vinyl versus digital DJ debate is a non-starter, because so many DJs have already abandoned records for CDs (also potentially boring, though certainly less so than iPods). If anything, computers could reinvigorate DJing. But we have to keep iPods and iTunes out of it. That or else wait for Apple to add scratching/cueing ability to their players — extraordinarily unlikely. iPods can be fun when people bring their own music, take a number, and play for a few minutes as at the iPod parties. 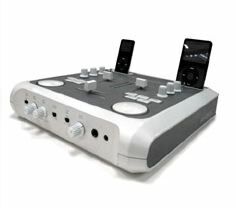 But selling serious “DJ equipment” using iPods is just silly, especially when it’s serious makers like Numark and Phonic. You can call it serious. Just don’t expect us to take it seriously.